Flo – Your husband should consider securing his dentures with dental implants. The implants are surgically placed in your jawbone. During the healing period, the fixtures fuse to your bone. 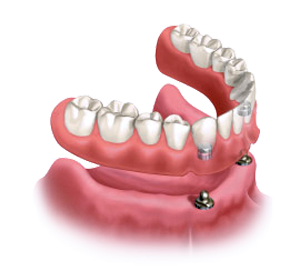 Standard implants can be used, or you can choose snap-on dentures, which use two implants and are more affordable. If it’s in your budget, choose implant overdentures with four to six fixtures will provide maximum stability and help the prosthesis feel more like natural teeth. The dentures will rest on the implants, instead of on your husband’s gums, so they will no longer irritate his gums or cause sores. When dentures are stabilized with dental implants, chewing efficiency will improve, so it will be much easier for your husband to eat with dentures. You can consider getting a second opinion. It can increase your comfort level in the dentist’s recommendation. Or it might help you determine that you need to switch dentists. Find an experienced implant dentist who is also skilled in cosmetic dentistry. Your husband will get cosmetic dentures that fit well and that are secured to quality implant fixtures. The change will finally give your husband a positive experience with dentures.